Why is AC used on aluminium TIG welding? What Is Aluminium Welding with Alternating Current (AC)? We all know that AC/DC isn’t just the name of a hard rock band* but that it also stands for alternating current (AC) and direct current (DC). But what is alternating current really all about? What does it have to do with aluminium? Whenever aluminium is welded using the tungsten inert gas welding process, alternating current is used. Why? It takes some practice to weld such an even TIG seam. 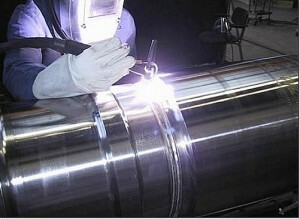 Welding aluminium is particularly difficult because the material is surrounded by an oxide layer. This only melts at approximately 2015 degrees Celsius, but aluminium itself, depending on the alloy, melts at around 650 degrees. This means that the aluminium would run away while the oxide layer was being melted, making welding impossible. The oxide layer needs to be destroyed or displaced in order for the process to work. When welding using alternating current (AC), the electrode continues to change from plus to minus. When the electrode is set to positive, the negatively polarized electrons move from the work piece into the electrode, rupturing the oxide layer in the process. The electrode is then set to negative and the electrons moving into the work piece generate heat—this is how the penetration required for the weld seam occurs. There are a number of good brands that produce 3phase acdc GTAW equipment for alternating current and ideally suited to aluminium applications. 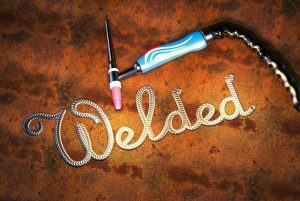 Are you the Owner of AC/DC Aluminum TIG welding equipment? Want to share your projects with us? We will promote your work. 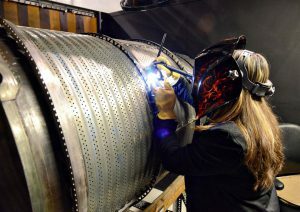 Send us images of TIG welding seams or weaves, your completed work, your equipment and a link back to your web site. Looking to sell your TIG equipment and wonder who would buy it? 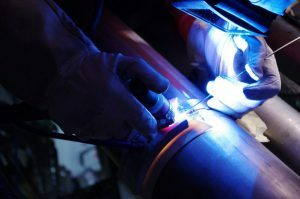 This entry was posted in Customer Resources, Welding and Cutting Processes Information and tagged ac/dc, aluminium welding, gtaw, how to, tig welding. Bookmark the permalink. 2 Responses to Why is AC used on aluminium TIG welding? Really happy that topnotchhandyman is also skilled at welding and enjoys our posts. Keep up the good work. If you want to share your experiences with our visitors, please get in touch.